Williams, B., & Boyle, M. (2008, January 30). The use of interactive wireless keypads for interprofessional learning experiences by undergraduate emergency health students. International Journal of Education and Development using ICT [Online], 4(1). Available: http://ijedict.dec.uwi.edu/viewarticle.php?id=405. The purpose of the study was to examine the use of interactive wireless keypads for interprofessional learning experiences. This study used a cross-sectional methodology in the form of a questionnaire to elicit responses about learning experiences using wireless keypads from a convenience sample of first year undergraduate emergency health students over one university semester in 2007. The findings in this study showed that students felt educational technology was helpful and important in their learning, with wireless keypad use providing high satisfaction. Class interaction using wireless keypads has assisted students to better appreciate and understand other health care disciplines within an interprofessional education setting. Integration of educational technology such as wireless keypads are considered important elements in undergraduate health care students learning approaches. Students have appreciated the alternative teaching and learning approach that wireless keypads have offered, thus improving engagement, interactivity, and uniquely, providing a broader understanding of other allied health care professions. Undergraduate emergency health (paramedic) education continues to undergo significant change in higher education. This change is not only occurring in contemporary research-led teaching curriculum but also through the integration of multidisciplinary learning and innovative use of educational technology. In order to promote and maintain good health among Australian citizens, it is necessary to have a health care workforce that is flexible, mobile and interdisciplinary so it can provide the necessary services, infrastructure, education and research basis. As patient management and health care becomes multifaceted and interprofessional, effective teamwork between allied health professionals is essential. Interprofessional education (IPE) is learning that represents a way of fostering collaborative and seamless, integrated patient-care education. Educating health care students in an IPE mode is one approach argued to do just this (Leaviss, 2000; Lewis & Stone, 2007). In IPE, different professions come together to learn ‘with, from and about each other to improve collaboration and the quality of care’ (Lewis & Stone, 2007, p. 29). Previously, undergraduate paramedic students have not had the opportunity to learn formally within large interprofessional health care classes and this culminated in a narrow view of other health care disciplines. The introduction of IPE underscores the transformation that is occurring in undergraduate paramedic education. The current rhetoric describing wireless keypads conveyed in the literature has in fact a long history of teaching and learning integration of over forty years (Barnett, 2006; Draper & Brown, 2004; Hall et al., 2005; Judson & Sawada, 2002). Wireless keypads (colloquially known as wireless response systems, student response system, personal response units, electronic voting system or clickers) are an interactive teaching and learning tool now commonly used in K-12 and higher education institutions. The wireless keypads use radio-frequency transmitters and receivers that collect student responses and software capable of embedding into Microsoft PowerPoint (Figure 1 and 2). Offer the students the opportunity to provide answers (anonymous) in a reassuring environment. (Banks, 2003; Barnett, 2006; Draper, et al., 2002; Draper & Brown, 2004; Freeman, et al., 2006; Hall, et al., 2005; Jones, et al., 2001; Poulis, et al., 1998; Schackow, et al., 2004; Sharma, et al., 2005; Van Dijk, et al., 2001). Whilst a plethora of literature exists on the efficacy of wireless keypads, no articles were located that attempted to use wireless keypads to promote IPE in large interdisciplinary lecture theatres. The purpose of this study is to identify the effect of using wireless keypads with first year undergraduate emergency health students’ and what learning experiences were gained in large interprofessional teaching settings. This pilot study used a paper-based questionnaire to elicit responses about learning experiences using wireless keypads from a convenience sample of first year undergraduate emergency health students over one university semester in 2007. 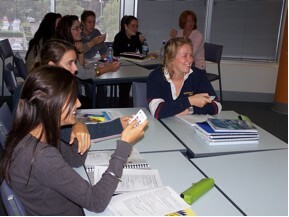 Students were enrolled full-time in the Bachelor of Emergency Health (BEH) degree offered at Monash University, Victoria, Australia. The BEH is a paramedic pre-employment (pre-registration) degree course offered full-time over 2 years (accelerated entry) or 3 years (standard entry). Students entering the BEH via the standard entry enrol in generic first year units, most of which are undertaken with other health care disciplines. These other disciplines include: Nursing, Physiotherapy, Occupational Therapy, Midwifery, Health Science and Social Work. The unit chosen for the project was HSC1031 Foundations of Health with a total student enrolment of 240. The wireless keypads were strategically used throughout semester 1 in weeks 2, 5, 6 and 13. Technology and software support was provided to the lecturer-in-charge prior to the study commencement. The primary reason for not using the wireless keypads each week was to overcome any excess use of educational technology and limit the “educational gimmick” factor. This novelty concern has been previously documented by (Barnett, 2006; Freeman, et al., 2006; Jones, et al., 2001). Four general health science groups were created: Paramedics/Nursing, Physiotherapy, Occupational Therapy and Health Sciences. These groups were specifically created to allow profession comparisons during lectures (a feature of the wireless keypad software). In other words, the software tabulated results between each discipline and comparisons could be made between each discipline (Figure 3). These discipline-specific groupings were used to reinforce the notion of IPE by allowing further analysis of why a discipline may have had alternative views or attitudes towards a particular topic or question. All students were offered the same questions in lectures allowing students and academic staff to see if discernable differences between health care groups occurred. These questions supported concepts and theory from lectures and allowed further discourse to take place in subsequent lectures and tutorials. Participation in the study was voluntary, ethics approval for the study was granted by the Monash University Standing Committee on Ethics in Research Involving Humans. Each participant also had additional data collected, consisting of their age group, course, and year of study being undertaken and whether the students had previously studied health science at a tertiary level. Using technology (wireless keypads) is helpful to my learning. Using educational technology (wireless keypads) offers me better ways of learning new material. Did wireless keypads improve your understanding of other health care professions? Fifty-three students participated in the study, the week 1 questionnaire had a return rate of 91%, with 64% of students completing the questionnaire in week 13. The majority of participants ranged between 15-19 years old (66%), 62% were females and, 37% were males. Most students (62%) entered their respective undergraduate program directly from high school, with only 26% of students having undertaken previous tertiary study. The use and incorporation of wireless keypads throughout the semester yielded positive results in comparative and non-comparative questions in both learning satisfaction and appreciation of other health care disciplines. Over three-quarters of students (77%) agreed or strongly agreed that using wireless keypads offered better ways of learning new material (week 1 - mean 4.10 vs week 13 - 3.86 p<0.18). Over two-thirds (67%) agreed or strongly agreed that using wireless keypads was helpful in their learning (week 1 - mean 4.13 vs week 13 - 3.77 p<0.076). Students either agreed or strongly agreed (72%) that wireless keypads increased satisfaction levels, with a further (63%) of students agreeing or strongly agreeing that wireless keypads facilitated overall learning. Almost 8 in 10 students (77%) agreed or strongly agreed that using wireless keypads increased students’ knowledge of other health care professionals. Sixty-three percent of students agreed or strongly agreed that using wireless keypads increased students’ knowledge about IPE. Wireless keypads did not assist in preparation for final examinations, with only (24%) agreeing or strongly agreeing with this question. Finally, almost three-quarters of students (73%) agreed or strongly agreed that the wireless keypads were not obstructive due to any technical difficulties. This study has demonstrated that students enjoy learning when using wireless keypads and that they offer an alternative and innovative pedagogical tool in providing better appreciation and understanding of other health care disciplines. Similar satisfaction levels were found in this study when compared to other studies cited in the literature (Barnett, 2006; Freeman, et al., 2006; Hall, et al., 2005; Jones, et al., 2001; Kaleta & Joosten, 2007; Poulis, et al., 1998; Schackow, et al., 2004; Sharma et al., 2005). Importantly, the use of wireless keypads during the semester was seen to be advantageous and offered alternative and innovative options to their learning. The bulk of student populations appear to enjoy the interaction and engagement wireless keypads create in learning environments. In traditional health professional education settings, the different professions learn very little about one another, but in shared learning contexts, students are enabled to acquire interprofessional knowledge, skills and attitudes (Ponzer, et al., 2004). As highlighted, no literature was found describing the use of wireless keypads in paramedic education or within the context of improving IPE learning outcomes. If undergraduate students are better prepared as flexible and mobile health care professionals then improvements to interprofessional practice (IPP) can occur (Stone, 2007). These improvements have led to a new and contemporary mode of health care education at Monash University for all health care students. The only negative finding in this study was the use of wireless keypads in preparation for examinations. Clearly not positive, we summarise that the final revision session during week 13 was not adequate for several reasons. Firstly, the final session during week 13 was only allotted 1 hour and integrating wireless keypads into this timeframe was both difficult and unsatisfactory. Several studies (Brown & Draper, 2004; Duggan, et al., 2007, Kaleta & Joosten, 2007) also emphasise the difficulties using wireless keypads with time constraints and faculty usability. Other sessions throughout the semester did not suffer with time constraints. The second reason was probably due to the content. The subject matter of the unit offered very few factual questions and relied heavily on attitudinal or controversial issues requiring students to anonymously voice an opinion. Moreover, these issues were not necessarily part of summative examinations. Significantly, several randomized, cross-over studies and descriptive studies (Hall, et al., 2005; Kaleta & Joosten, 2007; Kennedy & Cutts, 2005; Poulis, et al., 1998; Sharma et al., 2005) have found that wireless keypads have improved grade point averages and final examination scores. Whilst, not included in the aims of this study, a similar study protocol could be considered for future comparative research designs. Careful consideration of type of transmission of keypads was taken, which fortunately was supported in our findings. Several studies have described learning distracters, when wireless keypads or radio frequency transmission has failed (Barnett, 2006; Stuart, et al., 2004). Coupled with the notion of “educational gimmick”, we wisely chose radio frequency over infrared transmission and avoided any information technology glitches throughout the semester. This study is limited by the small sample size and use of one teaching institution. As this was a pilot study, with no control group due to only one lecture being programmed each week, some of the results lack external validity and therefore should be interpreted with caution. Integration of educational technology such as wireless keypads are considered important elements in undergraduate health care students learning approaches. Students have appreciated the alternative teaching and learning approach that wireless keypads have offered, thus improving engagement, interactivity, and uniquely, and assisting to provide a broader understanding of other allied health care professions. We are grateful to the students who participated in the study. We would also like to thank the reviewers for their constructive feedback during the review process. Funding was obtained through the Monash University Faculty of Medicine, Nursing and Health Sciences - Learning and Teaching Performance Grant in 2006. Banks, D. 2003. Using Keypad-Based Group Process Support Systems to Facilitate Student Reflection. In: Crisp G, Thiele D, Scholten I, Barker S, Baron J, editors. Australasian Society for Computers in Learning in Tertiary Education; Adelaide. Barnett, J. 2006. "Implementation of personal response units in very large lecture classes: Students perceptions". Australasian Journal of Educational Technology, vol. 22, no. 4, pp. 474-494. Burnstein, R., Lederman, L. 2001. "Using Wireless Keypads in Lecture Classes". The Physics Teacher, vol. 39, pp. 8-11. Draper, S., Cargill, J., Cutts, Q. 2002. "Electronically enhanced classroom interaction". Australasian Journal of Educational Technology, vol. 18, no. 1, pp. 13-23. Draper, S., Brown, M. 2004. "Increasing interactivity in lectures using an electronic voting system". Journal of Computer Assisted Learning, vol. 20, no. 2, pp. 81-94. Duggan, P., Palmer, E., Devitt, P. 2007. 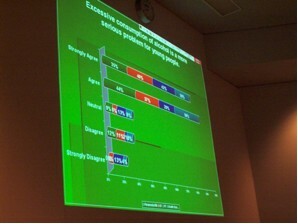 "Electronic voting to encourage interactive lectures: a randomised trial". BMC Medical Education, vol. 7, pp. 25. Freeman, M., Blayney, P., Ginns, P. 2006. "Anonymity and in class learning: The case for electronic response systems". Australasian Journal of Educational Technology, vol. 22, no. 4, pp. 568-580. Hall, R., Thomas, M., Collier, H., Hilgers, M. 2005. A Student Response System for Increasing Engagement, Motivation, and Learning in High Enrollment Lectures. In: Eleventh Americas Conference on Information Systems; Omaha, NE. Jones, C., Connolly, M., Gear, A., Read, M. 2001. "Group interactive learning with group process support technology". British Journal of Educational Technology, vol. 32, no. 5, pp. 571-586. Judson, E., Sawada, D. 2002. "Learning from past and present: Electronic response systems in college lecture halls". Journal of Computers in Mathematics and Science Teaching, vol. 21, no. 2, pp. 167-274. Kaleta, R., Joosten, T. 2007. Student Response Systems: A University of Wisconsin System Study of Clickers. Boulder: Educause Center for Applied Research. Kennedy, G., Cutts, Q. 2005. "The association between students' use of an electronic voting system and their learning outcomes". Journal of Computer Assisted Learning, vol. 21, no.4, pp. 260-268. Leaviss, J. 2000. "Exploring the perceived effect of an undergraduate multiprofessional educational intervention". Medical Education, vol. 34, no. 6, pp. 483-6. Lewis, B., Stone, N. 2007. "Shaping a sustainable interprofessional education". Focus on Health Professional Education: A Multi-Disciplinary Journal, vol. 8, no. 3, pp. 27-45. Ponzer, S., Hylin, U., Kusoffsky, A., Lauffs, M., Lonka, K., Mattiasson, A., et al. 2004. "Interprofessional training in the context of clinical practice: goals and students' perceptions on clinical education wards". Medical Education, vol. 38, no. 7, pp. 727-736. Poulis, J., Massen, C., Robens, E., Gilbert, M. 1998. "Physics lecturing with audience paced feedback". American Journal of Physics, vol. 66, no. 5, pp. 439-441. Schackow, E., Chavez, M., Loya, L., Friedman, M. 2004. "Audience Response System: Effect on Learning in Family Medicine Residents". Family Medicine, vol. 36, no. 7, pp. 496-504. Sharma, M., Khachan, J., Chan, B., O’Byrne, J. 2005. "An investigation of the effectiveness of electronic classroom communication systems in large lecture classes". Australasian Journal of Educational Technology, vol. 21, no. 2, pp.137-154. Stone, N. 2007. "Coming in from the interprofessional cold in Australia". Australian Health Review, vol. 31, pp. 332-340. Stuart, S., Brown, M., Draper, S. 2004. "Using an electronic voting system in logic lectures: one practitioner’s application". Journal of Computer Assisted Learning. vol. 20, no. 2, pp. 95-102. Van Dijk, L., Van Den Berg, G., Van Keulen, H. 2001. "Interactive lectures in engineering education". European Journal of Engineering Education, vol. 26, no. 1, pp. 15-28. Williams, J. 2003. Learning by Remote Control: Exploring the use of an Audience Response System as a Vehicle for Content Delivery. In: Crisp G, Thiele D, Scholten I, Barker S, Baron J, editors. 20th Annual Conference of the Australasian Society for Computers in Learning in Tertiary Education; Adelaide. This work is licensed under a Creative Commons Attribution-NonCommercial-NoDerivs 3.0 Unported License. It may be reproduced for non-commercial purposes, provided that the original author is credited. Copyright for articles published in this journal is retained by the authors, with first publication rights granted to the journal. By virtue of their appearance in this open access journal, articles are free to use, with proper attribution, in educational and other non-commercial settings.